Home Celtic Heroes Winter Update! Out now on iOS and Android! 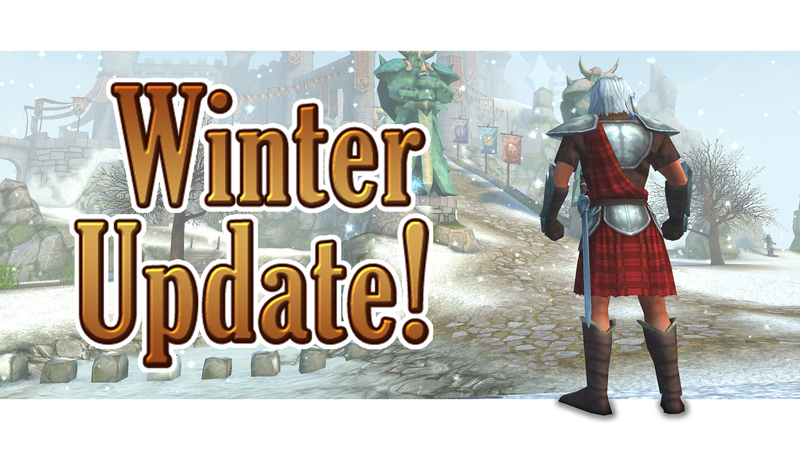 Our new Winter Update out now on Android and iOS! · Harsh snowstorms batter the ramparts of Farcrag Castle as the Dor Keln snows reach our shores. The lands of Lirs Reach, Farcrag Castle and the Arena have got a bit chillier this season. Remember to wear your mittens! · Firebreath and Aeon chests have been combined! This will include 2 new fashion sets, Aeon fashion, the jackpot Dragon Eggs and more! · We will be reducing down to one chest. There will be some seasonal content in the chest. Other content will remain throughout the year. · Shaman Fashion – The fashion vendor in Farcrag Castle has acquired an exotic new fashion from a far-off land. Bring them fashion tokens. They will happily exchange their wares with you. · Seasonal Vindicator Fashion – A chest exclusive fashion! Open Snowstorm Chests for a chance to receive this proud knight fashion! Vindicator Fashion will only be available during the Winter Season. It may return in future winter updates. · A festive barding for your Battlemount! Obtainable via the Snowstorm chests, these will make any battlemount shine with Christmas spirit. *Only available during the Winter season! May return in future winter updates. · Become the man with the finest facial hair in all Dal Riata, Auctioneer Padraig MacLir. Obtainable via Charm Tokens. · Valiant hunter, sharp eyes, razor talons. The perfect battle companion. · Thranduil would be jealous. Magnificent watcher of the forest, the Elk Battlemount. · Lord MacLirs’ castle has received another revamp! The arena has received a grand makeover fit for the majesty of Farcrag Castle. Visit to challenge any who dare fight in arena combat. · The lord has not been the only one busy. The dark lair of Dustwither Catacombs has twisted into a fearsome land of the dead. Be wary travelers of these lands. · A new competitive competition system has been added to the leaderboards! These timed events will be available for all adventurers with special prizes for the best of the best! The first competition? Fishing! Details coming soon! · Return of the festive hat quest! Visit Meirich Colgach in Farcrag Castle to begin your festive quest for the Cheerful Jester’s Hat! · Sound effects for walking have been updated. Different terrain, different sound! · Cooking Fashion Vendors have now been corrected for Purple and Turquoise variants. · Rabbit Pie regen, fixed. · Samurai fashion no longer clips on sit emote. · Clan creation timeout bug, fixed. · Exotic fish now have correct visual appearance when caught. · Mage wand weapon effects positioning, fixed. · Giant Dragon Hatching no longer clips player model. · Cream of Carrot soup requirements, fixed. · War Horse breeding requirements, fixed. · End-game fish weights corrected. · Pets idle animation while fishing, fixed. · Dire bat in tunnels can no longer fly into a new realm of existence.